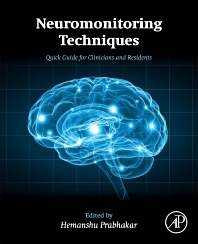 Neuromonitoring Techniques: Quick Guide for Clinicians and Residents provides a quick and easy guide to understanding various neuromonitoring equipment. Chapters include intracranial pressure monitoring, EEG-based monitors, evoked potentials and transcranial doppler. This book is written for trainees, clinicians and researchers in the fields of neurosurgery, neurocritical care, neuroradiology, neuroanesthesia and neurology. As specialized neuromonitoring is now routinely done in neurosurgical cases, it provides an important resource for neurologists, neurophysiologists, anesthesiologists and residents who are expected to have theoretical and practical knowledge on different systems. Each monitoring system is discussed separately, with examples, images, reference values and their interpretations. Dr. Hemanshu Prabhakar is an Additional Professor in Neuroanesthesiology at the All India Institute of Medical Sciences (AIIMS), New Delhi, India. He received his training in neuroanesthesia in the same institute. Recently, he completed his PhD, and now has the honor of being the first PhD (Neuroanesthesia) in the country. He is recipient of the AIIMS Excellence award for notable contribution in academics. He has more than 200 publications in national and international journals to his credit. He is a reviewer for various national and international journals. He is also a review author for the Cochrane Collaboration and has special interest in evidence based practice of neuroanesthesia. He is a member of various national and international neuroanesthesia societies and past Secretary of the Indian Society of Neuroanesthesia and Critical Care. He is an invited faculty for various national and international conferences. He is on the Editorial board of Indian Journal of Palliative care and is the executive editor of the Journal of Neuroanaesthesiology and Critical Care. He has contributed chapters to various National and International books.